While Machine Translation (MT) is generally not a recommended translation method, it's useful in some cases; for example, if you have a lot of non-customer-facing content, or you want to translate something in conjunction with human post-edit. Transifex supports Google Translate, Microsoft Translator and Amazon Translate. You'll need to have an account with one of these services before you can use it for machine translation in Transifex. Depending on which service you choose and how many words you're translating, you might need a subscription for that service too. Please note, Microsoft Translator subscriptions have been moved from Microsoft DataMarket to Azure. You'll need a new subscription key in order to continue using Microsoft Translator after April 30, 2017. To learn more, read the announcement from Microsoft here. On the left menu, click on Machine translation. Select the machine translation service you'll be using. If you want to use Microsoft Translator, choose Microsoft Translator Text API (latest) unless you have an existing Microsoft DataMarket subscription from before December 31, 2016 (you can read more about the two Microsoft Translator options here). If you chose Google Translate, add your API key. If you chose Microsoft Translator Text API (latest), add your subscription key. If you chose Microsoft Translator (deprecated), add your Client ID and Client secret. In case you need to use a different machine translation key for a specific project, please see the section below. Select the project from the project navigation in the Dashboard. In the Project Actions section on the right, click on Override organization's Machine Translation settings. A modal will open where you can edit your Machine Translation settings. Select the machine translation service you want to use. Automatic Machine Translation is available on the Pro plan and up as part of our Advanced Workflows feature. If you have a translation workflow that always starts with Machine Translation, Automatic Machine Translation can save you from needing to manually start MT. Automatic MT will run whenever you add new content or update existing content to a project. 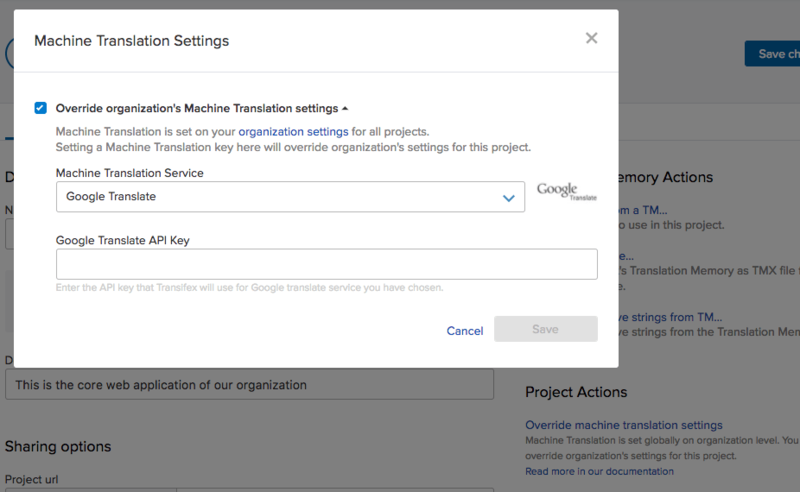 From the Dashboard, select the project you want to enable Automatic Machine Translation for. In the submenu, click on Workflow. In the Pre-translation step, enable the Machine Translation Fill-up option. If you have TM Autofill enabled for a project, 100% Translation Memory matches will be used before Machine Translation runs. Automatically machine translated strings don't go into your Translation Memory until they've been marked as reviewed. The same is true for strings that were machine translated in bulk. If you add new project languages, or enable Automatic Machine Translation and/or TM Autofill after uploading/updating files, you'll need to manually trigger MT and fill up from TM. You can do this by clicking the Enable fill-up button in the Fill-up on demand section in Workflow tab of your project settings. Please note that MT sometimes doesn't exclude HTML tags and treats them as translatable text. Unfortunately, Transifex can't affect the way MT translates a string, as machine translation service is not provided by Transifex. Our recommendation is to perform a human review on the machine translated strings. Please note that the numbers in the highlighted part can be used for shortcut purposes. Kindly refer to the article about about how the HTML code can be handled in the Editor. So, when an HTML placeholder is preserved in the translation, the same number is used in the translation text as well. In order to easily fix the tags in the translation, you can remove the wrong tags from the translation string and populate the correct ones by simply clicking on the placeholders in the source string's area. Kindly refer to the video: https://screencast.com/t/RjOSJKVl5.